Today is the official opening day of the Mobile World Congress 2011, and it is shaping up to be another busy day for our eyes and ears there. We will be present at the most anticipated event today - LG's presentation of the LG Optimus 3D, and the LG G-Slate, the first cell phone and tablet to offer 3D video capture. Stay tuned to PhoneArena and refresh often as today is shaping up to be another whirlwind of events. I don't see anything on HTC? 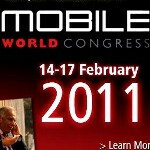 Is HTC at the MWC 2011? Look at the Microsoft and Samsung times listed. All of these 8 numbers cannot be correct: Microsoft - 6pm CET / 10am EST / 9am CT / 7am PST Samsung - 7pm CET / 12pm EST / 11am CT / 9am PST At least one of these 8 times is incorrectly listed. Which one? I think it should be: Microsoft: 4pm CET Samsung 6pm CET And that all others are correct. It says here:http://www.microsoft.com/presspass/presskits/windowsphone/, that the Microsoft keynote should be on Monday, Feb. 14 at 7 a.m. PST/10 a.m. EST, so I think it is right when I say 4pm CET, but I am not sure about the Samsung times.